The book A Dictionary of Cromer and Overstrand History tells you about the sport was played in times past. These football pages bring you lots of other materials that couldn't be included in the printed version. It would be wonderful to find out more about Colin A.Watson, the artist of these posters. He lived in Chapel Street and played for the Cromer team. 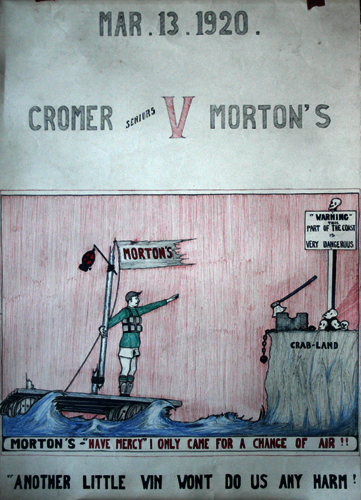 The posters have been kept in the Baker family, advertising Cromer football matches for 1920. Hand drawn, it must have been a labour of love to produce at least one every week to promote the game at Beef Meadow or an away visit. Any further information that you can provide on the teams and the games at that time would be appreciated.